Plants often take up nutrients in excess of their immediate needs and store the extra in cell vacuoles. 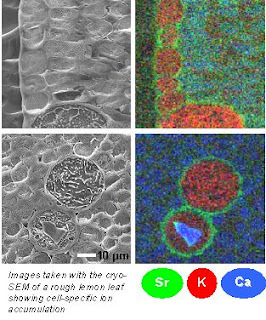 The nutrient storage pools in different leaf cell-types are compositionally distinct. For instance, phosphate and Ca appear to never co-localise in the same cell whereas magnesium, potassium, chloride and nitrate may share similar cellular locations but can be at very different concentrations in different cells. We have recently conducted a survey of leaves from 30 phylogenetically distinct species and discovered two “evolutionary conserved” patterns of cell-specific Ca distribution. In grasses, vacuolar Ca is present at high concentrations in epidermal cells but undetectable in mesophyll cells. In contrast, in many eudicot species Ca is at a high concentration in the palisade and spongy mesophyll cells but undetectable in epidermal cells. We have recently discovered the mechanisms behind these patterns in Ca distribution, and their physiological significance. Such knowledge is fundamental to our understanding of how plants function and should ultimately allow the nutritional enhancement of crop plants (and consequently fortification of animal and human diets) without adversely affecting crop plant physiology. In both of these studies, by surveying natural variants of Arabidopsis we realised we could correlate the transcript abundance of relevant transporters with leaf Ca or Mg content. We extended this technique to use the whole transcriptome of a greater pool of Arabidopsis variants and mutants, to identify a number of other genes we suspect to have a role in cell-specific elemental accumulation for Ca, Mg and Zn. We demonstrated that one of these candidates, TPC1 (two-pore cation channel1), prevents the build-up of high Ca concentrations in epidermal vacuoles; TPC1 is preferentially expressed in the epidermis and encodes a protein present on the vacuolar membrane, it is likely that TPC1 is a Ca release pathway out of these vacuoles. We have published a hypothesis that segregation of elements is key for maintaining nutrient availability in plants. For instance, phosphorus (P) is stored in the epidermis and Ca in mesophyll vacuoles; if they were stored together, P would form an insoluble precipitate in the presence of Ca, which would make both elements unavailable. This has implications for animal and human nutrition and of the effectiveness of the plant biofortification strategies as outlined in the review and was featured in ‘Plant Cuttings’ (Annals of Botany 107(4) pp.v), which states ‘This work emphasises further the pivotal role of calcium in plant biology’. Our work describing mesophyll-specific storage of magnesium (Mg) shows that it is required in low Ca conditions as an osmoticum for growth, and that this is conferred by mesophyll-specific expression of two MGT (magnesium transporter) proteins. This work was the subject of a commentary written by Brian Waters on ‘Moving magnesium into plant cells’ (New Phytologist 190:510–513).It is now clear that vacuolar membrane solute transport processes can control flux across the plasma membrane, and can even control the concentration of solutes in the cell wall. Our fundamental findings on cell-type preferential nutrient storage point to a need for a paradigm shift in how we think about the processes that control plant cell ion transport. The convention at present is that the plasma membrane is the dominant factor in determining what enters cells; however, we have shown that the vacuolar membrane has a major influence on fluxes across the plasma membrane, and that it is likely that there is considerable cross-talk between both membranes. This appears to be the case for Ca, Mg, and other nutrient ions. For these projects we have collaborations with international colleagues: Alex Webb at the University of Cambridge, UK and Kendal Hirschi, Baylor College of Medicine, USA. Nationally we collaborate closely with Associate Professors Burton and Kaiser, and Professor Tyerman at the University of Adelaide.